Deputy Defense Minister slams support for newly declared PLO unity government, 'pretty wrapping' for terror attacks and murder. Deputy Defense Minister Danny Danon (Likud) condemned the swearing in of the new Fatah and Hamas unity government on Monday, which took place in Ramallah. 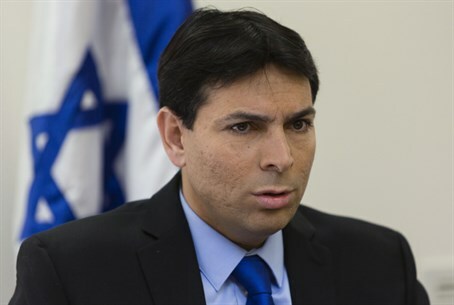 "The replacement of ministers in the Palestinian government is just a pretty wrapping for the terrorist attacks that were conducted and will be conducted under their protection," declared Danon. "Now, all aid given to the Palestinians by the United States and other countries directly aids terror attacks against the state of Israel," warned the minister. Danon noted that he has recently met with American Congressmen, asking them to suspend financial aid to the Palestinian Authority (PA) in response to the new unity government with the terrorist organization Hamas. The unity government was nearly derailed by a last minute demand by Hamas not to have the Ministry of Prisoners cancelled. A zero hour compromise between Hamas and Fatah left the Ministry intact, but placed it directly under unity government Prime Minister Rami Hamdallah, instead of under a separate minister. The last minute confrontation followed warnings by PA officials that the US may withdraw funding from the PA if the Ministry was not dissolved, given that it directly pays salaries to terrorist prisoners. While US Secretary of State John Kerry "expressed concern" to Abbas by phone on Sunday, a US official merely said "the United States informed Israel that it will not support the unity government immediately after it is sworn in." The establishment of a "terror government"
Housing and Construction Minister Uri Ariel (Jewish Home) added his condemnation of the new "terror government." "Abbas signed on the establishment of a terror government today together with lowly murders, who murdered dozens and hundreds of Israelis," said Ariel, noting that Abbas "once again proved today that he isn't interested in peace with the state of Israel." "I expect the government of Israel to give a clear Zionist answer, and immediately market and build the thousands of apartments that have been frozen till now," added Ariel. Prime Minister Binyamin Netanyahu similarly criticized the supporters of the unity government on Monday, particularly focusing on European backers. "Islamic terror is raising its head in Europe, and the latest horrible manifestation of this was the abominable murder in the Jewish museum in Brussels," Netanyahu said. "I find it strange that governments in Europe that harshly condemn this murder, also speak with lack of clarity and even in friendly tones about a unity government with Hamas, a terror group that carries out and praises such crimes. It is worth noting that Hamas is on the EU's list of terrorist organizations. That listing specifically includes both "Hamas" and "Hamas-Izz al-Din al-Qassem," meaning that both the military and governmental branches of Hamas are recognized as terror groups by the EU.